My choice, chiles en nogada. In front of my friend, hearts of palm salad, accompanied by lemonadas, bread and salsas. I don’t get out to eat very often – certainly not as often as I would like. Work and the time to get out are the main things that hold me back. My friend Val asked me out to an afternoon meal at La Romeria, in an area of Centro that is becoming quite interesting. The restaurant moved from Santa Maria, overlooking Morelia, to a location that fronts on a small park and allows their tables to spill out onto a closed drive in front. It is a very nice place to visit any day and as this Sunday afternoon was particularly warm and cloudless, it was impossible to resist. La Romeria focuses on traditional recipes from the Yucatan. We don’t have a lot of restaurants that represent that region in Morelia so it is a welcome change. They have specials every day and thankfully, they have managed to maintain a small, focused menu. The meals we had were very good. Chiles en nogada is a very special dish, requiring a lot of ingredients and time. The dish hails from Puebla, but because but because it embodies the colors of the Mexican flag and its history – it is loved all over the Bajio. 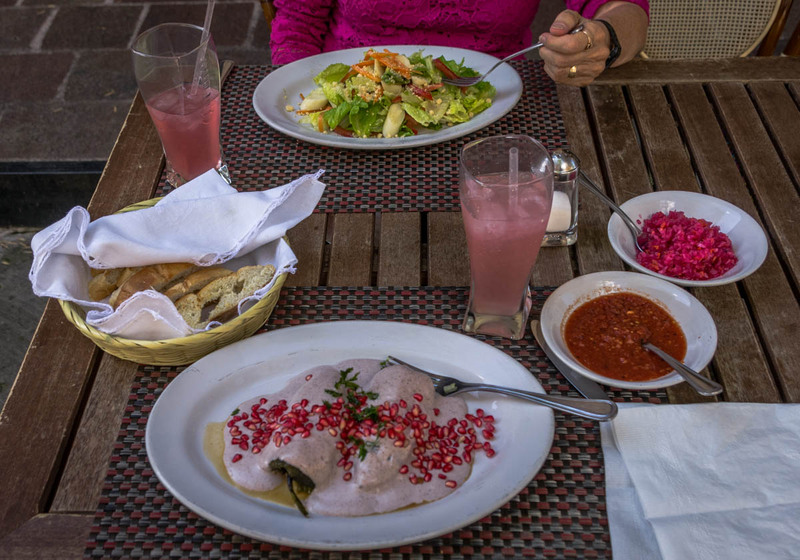 Every bit as good as it looks – La Romeria belongs on any list of restaurants to try in Morelia. Thank you Cristina! In the rush to get out of the house in the morning, I rarely have time to hunt the best links. I certainly agree this dish deserves more examination because of how it evokes a time when the melding of the old and new worlds was very much a part of everyday life. Do follow Cristina’s link and look over her excellent writing on the food, culture and life in Mexico!